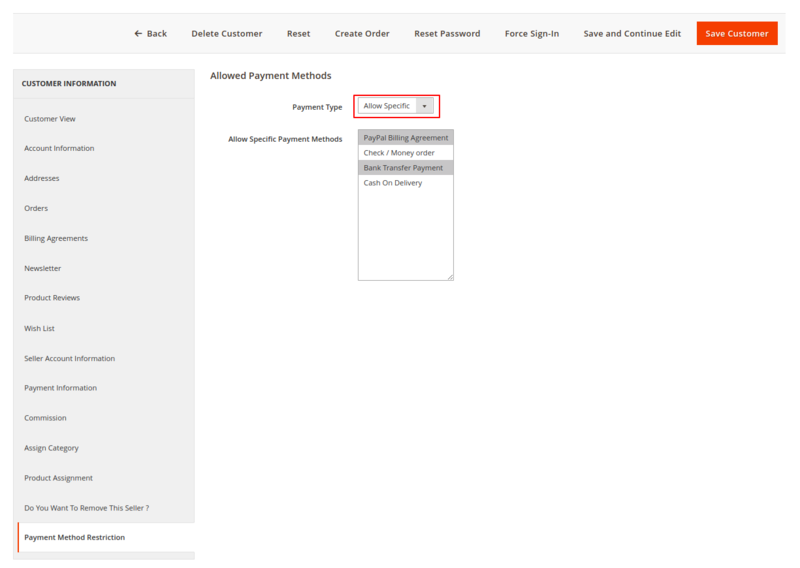 Using Magento 2 Marketplace Payment Method Restriction module, the admin can assign the payment methods to products and the sellers. Sometimes the admin wants to restrict few of the payment methods for some products and sellers. So, instead of completely disabling the payment methods for the store, restrict the payments methods which the admin doesn’t wish to use for particular products and sellers. The marketplace sellers also can assign payment methods to their products. During the checkout process, the customer can view the assigned payment methods to place an order. This module is an add-on of Multi Vendor Marketplace Module. To use this module you must have installed Webkul Multi Vendor Marketplace Module first. Note: The extension will not create any new payment method for you. The admin can enable or disable the module as per convenience. Assign specific payment methods to a product. Restrict the payment methods for the product types – Simple, Configurable, Virtual and downloadable. The admin can also assign payment methods to the individual seller. The admin can assign payment methods to the seller’s product also. Only assigned payment methods available while checkout to the customers. For module translation, navigate to the following path in your system app/code/Webkul/MpProductPaymentRestriction/i18n/en_US.csv. Open the file named en_US.CSV for editing as shown in the below screenshot. 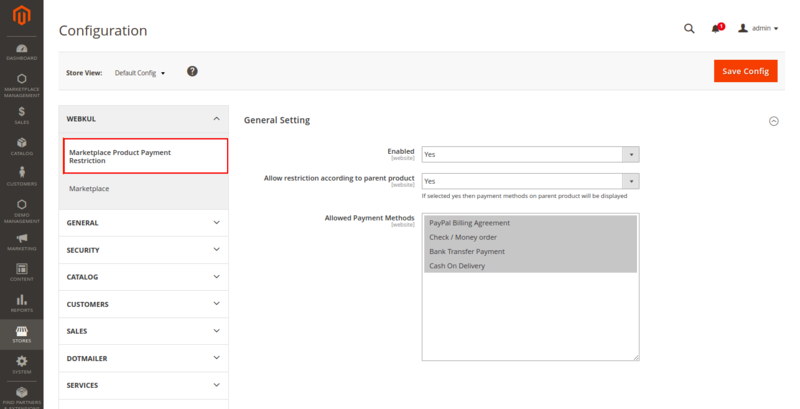 After the module installation, the admin can configure the module settings by navigating to the Stores -> Settings -> Configuration -> Webkul -> Marketplace Product Payment Restriction as shown below. Enabled – Set the option to Yes if want to display the restricted payment methods only on the frontend. Else set the option to No if want to display all the payment methods. Allow restriction according to parent product – If set as Yes then the payment methods displayed of child products will be based on the allowed payment methods for the respective parent product. If set as No then payment method should be allowed for each child product separately. Allowed Payment Methods – Choose the payment methods wants to enable at the frontend. The selected payment methods will be applicable to all the products and the sellers. And, lastly hit the Save Config button to save the configuration successfully. The admin can restrict the different payment methods for each product as shown below. Allowed Payment Methods – Choose the payment methods wants to enable for that particular product. Allowed Payment Type – The admin can select “Allow specific” for enabling selective payment methods or select “Allow all” for enabling all payment methods. And, lastly hit the Save button to save the product successfully. The admin needs to configure the payment methods for each product individually. The admin can configure the payment methods for the admin and seller products as well. The admin can restrict the payment methods for the product types – Simple, Configurable, Virtual and downloadable. The admin can restrict the payment methods for the products which were existing before the installation of this module. The admin can even restrict the different payment methods for each seller. For this, the admin will navigate to Marketplace Management -> Manage Sellers as shown below. Here, the admin will select the seller to whom the admin wants to assign the payment methods. After selecting the seller, the admin gets navigated to the seller information page as shown below. Under Payment Method Restriction, the admin can assign the Payment Type as “Allow all” or “Allow Specific”. If “Allow Specific” is selected then the admin can select the payment methods from the listed methods else to select “Allow All” for allowing all payment methods selection. Note: The seller can assign only those payment methods to their products which are been assigned to the sellers by the admin. The seller also can restrict the different payment methods for each product. For this, the seller needs to navigate to the product edit page as shown below. Allowed Payment Method- Choose the payment methods that are needed to be enabled for that particular product. The admin seller to configure the payment methods for each product individually. The seller can restrict the payment methods for the product types – Simple, Configurable, Virtual and downloadable. The seller can restrict the payment methods for the products which were existing before the installation of this module. 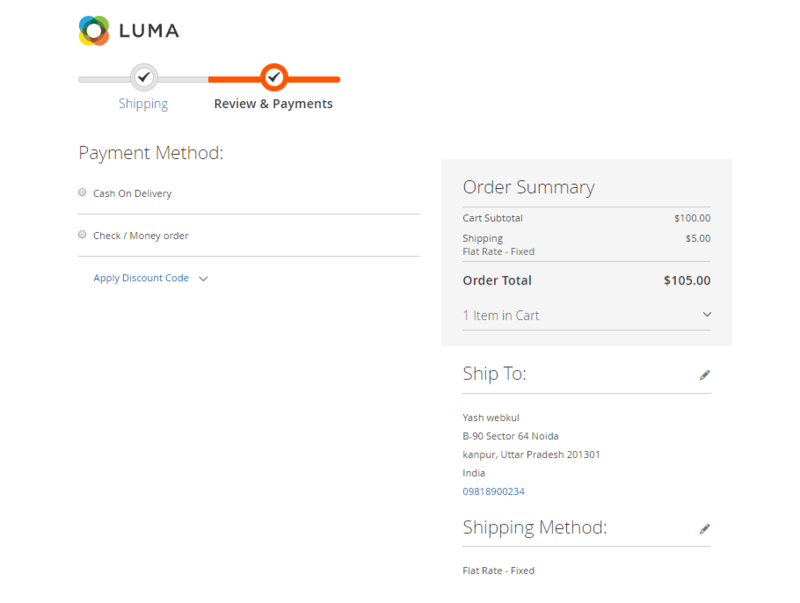 Now at the front-end, the customer can view the restricted payment methods while placing the order. And accordingly, the customer will select the payment method when proceeding further for placing the order. Case 1: What if the shopping cart has multiple products with different payment methods enabled? It will check the common payment methods among the multiple products in the cart and accordingly will display them at the checkout.